A record number of charter schools, all outperforming nearby district schools, have been recommended for denial by LA Unified staff when their petitions come before Tuesday’s school board meeting. More than 15,000 students could be affected by board decisions involving charter schools that are up for renewal or revision. Seven schools that have 6,730 students are recommended to have their charters revoked, including LA’s top-ranked charter high school, while three other schools asking for revisions affecting 2,060 students are also recommended for denial by staff. One revision, for WISH Middle School, was resolved over the weekend and their petition has been pulled from Tuesday’s agenda. In the past five years, 155 out of 159 charter school renewals were approved and 42 out of 43 material revisions of a charter school were approved by the school board, according to CCSA. LA Unified oversees the charter schools, which must petition for renewal every five years. Many of the independent charter schools up for renewal are co-located on traditional public school campuses. The charter school division makes recommendations to the school board for approval or denial. The elected school board members have on multiple occasions rejected the staff findings. Meanwhile, five charter schools up for renewal and revisions are recommended for approval and are slated to be added to a consent agenda without comment by the board members. Those schools, affecting more than 1,400 students, will be decided on at a morning meeting at 9 a.m. during about an hour of discussion. Then the school board will go into closed session at 10 a.m. and at noon will reconvene with their main agenda. The nine schools that face rejection from the school board have their hearings scheduled for a 5 p.m. meeting on Tuesday. School board President Steve Zimmer has tried to schedule meetings in a more compact manner to make it easier for faculty and parents to attend and speak about the issues involving their schools without having to wait for hours. Among the most controversial proposed rejections is El Camino Real High School, which has 3,900 students and has won academic awards. 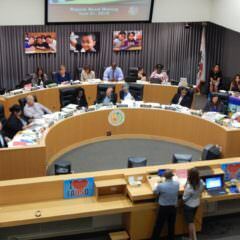 The district is recommending the second step toward revoking its independent charter school status and turning it back into a traditional public school, following an investigation into financial mismanagement first reported in the Los Angeles Daily News. The district staff said that their concerns have not been adequately answered. Three Magnolia Science Academy schools are recommended to have their charter renewals denied, two of which were ranked in April by U.S. News & World Report in the top 100 high schools in California. Magnolia Science Academy 2 in Van Nuys was the top-ranked charter high school in Los Angeles Unified, and along with Magnolia Science Academy Reseda made the top 3 percent of all U.S. high schools. According to the staff reports, all three schools outperform neighboring district schools on this year’s state tests in both math and English, with the exception of Magnolia Science Academy 2, where students meeting or exceeding English standards fell 12 percentage points below the average at nearby resident schools. However, the report shows that the school’s reclassification rate of English language learners was twice that at resident schools, while its percent of EL students nearly matched resident schools’. The reclassification rate at Magnolia Academy 2 was 30 percent, and 51 percent at Magnolia Academy 3, about twice the rate of neighboring district schools. The reclassification rate Magnolia Science Academy in Reseda, located in Board District 6, was 33 percent, according to the LA Unified staff report. That is triple the rate of nearby Reseda High School (11 percent) and more than four times the rate at Canoga High (7 percent). Magnolia’s rate was nearly three times the district’s rate last year, and the report shows Magnolia’s reclassifications rose 3.6 percent from the previous year while the district’s as a whole fell 4.5 percent. Between 2011 and 2015, the three Magnolia schools sent 92 percent of its graduates to college and 95 percent of its seniors completed A-G college readiness standards, according to the staff report. More than 65 percent of graduates each year are the first in their families to go on to college, Magnolia data show. Since its first graduating class in 2008, Magnolia has graduated more than 700 students and sent them to college. The average AP participation rate of all three schools is 30 percent higher than surrounding residential high schools, Magnolia reported. The Reseda school, which serves grades 6-12, also far outstrips district schools in graduation and A-G completion rates; 98 percent graduate, with 100 percent passing A-G courses, meaning they are eligible for University of California and Cal State University acceptance. At Reseda High, 84 percent graduate with 42 percent UC/CSU ready. At Canoga High, 75 percent graduate with 29 percent UC/CSU ready. The district as a whole is predicting a 75 percent graduation rate this year, a record, while its A-G completion rate is 42 percent. The school has 91 percent of students qualifying for free and reduced-price lunch; 12 percent were English-language learners and 84 percent were Latino. The district staff report also shows that the school’s special education enrollment (16 percent, with 89 percent high-incidence, 11 percent low-incidence) exceeded the district’s at similar schools (9 percent). Special education students made up 20 percent of enrollment last year at Reseda High and 15 percent at Canoga High. Renewals of Celerity Dyad Charter School, on its own campus south of downtown LA, and Celerity Troika Charter School, co-located in Eagle Rock in Northeast LA, have also been recommended for denial. Celerity Educational Group started in Los Angeles in 2005 and now has eight schools in Los Angeles County (six authorized by LA Unified) and has expanded to Ohio, Louisiana and Florida. The report states that Celerity Troika outperformed the nearby district schools as well as the district as a whole. It also reclassifies EL students at a higher rate than the district, 19 percent last year compared to 12 percent for the district, with Latino and disadvantaged students increasing their performance in both English and math this year. Celerity Troika, located in Board District 5 and co-located on two campuses, Luther Burbank Middle School and Garvanza Elementary School, enrolled 609 students as of last October, with 68 percent qualifying for free or reduce-price lunch, 24 percent English language learners, 77 percent Latino and 4 percent African-American. On the state English language arts test, 68 percent of Celerity Troika students met or exceeded standards, compared to 38 percent of district schools in its area, according to the district staff report. In math, those figures were 67 percent for Celerity and 28 percent for area district schools. In its written response to the report, Celerity states that the issues brought up are old, do not represent the current organization and have been addressed. It also notes that the state Board of Education recently recommended approval of two new Celerity schools. In an email over the weekend, Celerity CEO Grace Canada said the organization was “blindsided” by the denial recommendation. District staff are recommending denials for two Citizens of the World schools in Board District 4: one for a new charter, called Citizens of the World Westside, and the other for an expansion of Citizens of the World 3, a K-5 on two sites with 470 students. It is petitioning to add grades 6-8. Citizens of the World Los Angeles operates three charters in LA Unified that enroll about 1,600 students. They had about five applications for every open seat this past year. The schools rank in the top 10 percent of all district schools in both English and math. The Westside school would serve 740 students in transitional kindergarten through 6th grade and expand to 1,020 students and add 7th and 8th grades by the fifth year. More than 5,000 family and community members from every local board district signed a petition asking the board to approve CWC Mar Vista’s expansion through 8th grade, according to the organization. Citizens of the World 3, as of last October, enrolled 368 students, 33 percent receiving free or reduced-price lunch, 11 percent were English language learners, 51 percent white and 32 percent Latino or African-American. Another reason for the denial recommendation was the number of material revisions, one of which was to add a preference for low-income families. The district staff report acknowledges that the school is outperforming area district schools, by 16 percentage points in English and 23 percentage points in math. Special education students make up 7 percent of enrollment, compared to 13 percent at neighboring district schools. The staff also recommended that the school board reject the Westside Innovative School House Charter Middle School’s request to add transitional kindergarten through 6th-grade classes, also in Board District 4. The letter noted that the charter division staff’s recommendation for denial did not relate to “WISH’s sound educational program, student achievement or educational performance,” but instead was based its assessment of the school’s ability to successfully implement the proposed changes. Also Tuesday, the school board will hold public hearings for petitions to open nine new charter schools from Maywood to Sherman Oaks that could hold more than 5,000 students. The school board in the same meeting is considering establishing the Horace Mann UCLA Community School, which doesn’t have a number of students associated with it but has a mission to recruit from charter schools and private schools. Mandell said the charter schools slated for their petitions to be rejected should have more of a chance to correct whatever problems the staff is finding. * This article has been updated to add that Citizens of the World was being recommended for denial in part based on its number of material revisions, one of which was to add a preference for low-income families, which it now has.